3D Man On Puzzle Podium Business PowerPoint Templates And PowerPoint Themes 1012-Deliver amazing Presentations with our above template showing 3d man standing on jigsaw puzzle podium. This image clearly defines the concept of winner and competition. Use this template for Business teamwork, Communication, Individuality and Leadership presentations. This template also imitates leader, marketing, strategy, success and team. Present your views using our innovative slides and be assured of leaving a lasting impression.-3D Man On Puzzle Podium Business PowerPoint Templates And PowerPoint Themes 1012-This PowerPoint template can be used for presentations relating to-"Man on puzzle podium, success, business, competition, finance, puzzles or jigsaws" Arrive with a bang with our 3d Man On Puzzle Podium Business PowerPoint Templates And PowerPoint Themes 1012. They assure you an explosive entry. 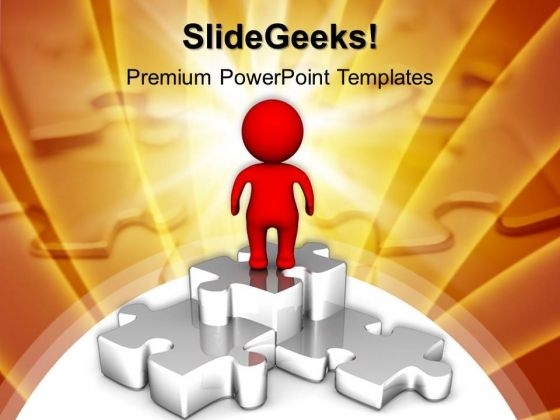 Earn the esteem of your colleagues with our 3d Man On Puzzle Podium Business PowerPoint Templates And PowerPoint Themes 1012. Give your thoughts that something special.